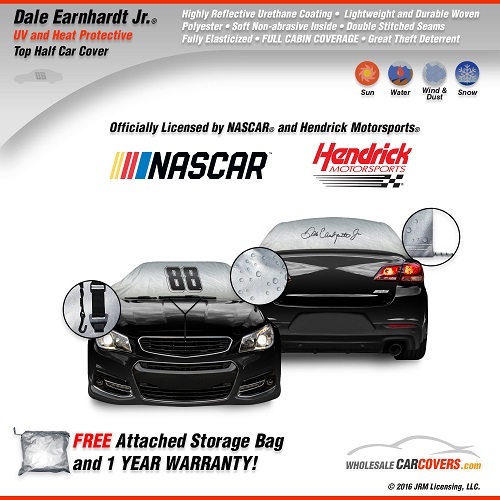 Our ALL NEW Officially Licensed NASCAR® Top Half Car Covers! Show pride for your favorite NASCAR® driver while taking care of your prized possession. We've printed the drivers number on the front windshield area of the cover and their signature on the back. Covers are currently available for #88 Dale Earnhardt Jr®, #48 Jimmie Johnson®, #5 Kasey Kahne® and the newest member of the team #24 Chase Elliott®. The Top Half Car Cover is a unique cover that fits around only the top half of the car. The cover is made from a high grade light weight polyester material that is UV resistant, heat reflective and made for all weather conditions. It will help keep your car's cabin cooler and also prevent the interior from fading. During the winter months it prevents ice and snow from accumulating on the glass areas of the car's cabin which means no more scraping your windshield. Just remove the cover and go. Also included is a sewn in storage bag for when not in use. The cover in fully elasticized for a snug fit. ** You may cut small slits above the hem for side view mirrors if you find it helpful. This can help to better secure the cover during high winds. One Year Warranty! Suggested retail price $69.99. 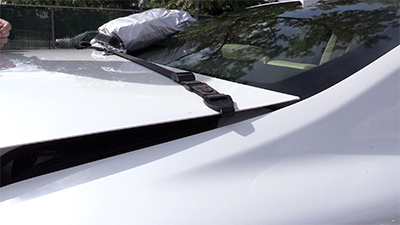 This cover fits car tops 110" x 80" or smaller cars like the Porsche or Mazda Miata. Click here for measuring and installation instructions. This cover fits car tops 129" x 85" or mid size cars like the Lexus ES 350 or Ford Mustang. Click here for measuring and installation instructions. This cover fits car tops 137" x 93" or larger cars like the BMW 7 Series up to a Lincoln Town Car. It can also accommodate some station wagons and crossovers up to 15' long. Click here for measuring and installation instructions.